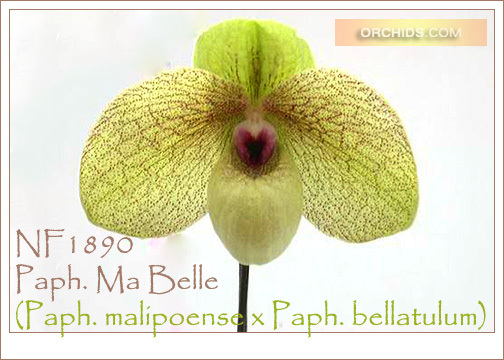 One of the most sought-after of all “bubble gum” Paph. hybrids, Paph. Ma Belle is in a class all its own ! A delightful mating of a Chinese parvisepalum and a brachypetalum, its yellow and green flowers are held proudly above its attractively mottled foliage. Adding to its charm is burgundy netting over its full petals, complete with the accent of a deep burgundy staminode and always eye-catching pouch. Highly Recommended ! .